Today Warren Throckmorton has published something old that is a must-read. 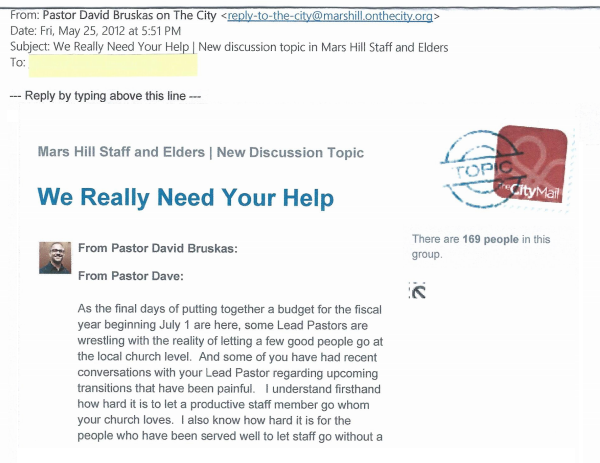 Wenatchee The Hatchet does not customarily frame an issue in those terms but the date of a missive from Dave Bruskas, described as sent from Bruskas to other MH leaders on The City, has a date on it that in itself makes it a must read for the history of Mars Hill. Whether this was the formal publication date of the content to The City or the date it was received via email is not necessarily important by itself. And more than anything, we hurt for those who have lost jobs. We would request that you abide by our spending targets per person. Please respect these decisions by not coming to us individually in the hope that they may be changed. Pastor Sutton and I are happy to clarify anything that is confusing. But we can’t devote any more time to hearing appeals. There is a great deal of Mars Hill history that has to be borne in mind in light of this communication quoted above. In April 2012 Driscoll was broaching the question of "is your church interested in becoming part of Mars Hill?" If Mars Hill was privately in a financial strait dire enough that a large-scale layoff was being finessed in May 2012 what did Mark Driscoll think was a reason to write to the public as though wanting to assimilate into what may have been a less than fiscally stable Mars Hill was a good idea? To be sure Chris Rosebrough has provided an explanation for how he thinks the church growth paradigm depends on leverageable debt to catalyze more growth ... but if we assume for sake of conversation the average church target of Driscoll wouldn't know this why would Driscoll have assumed it was reasonable to encourage churches to give their assets to Mars Hill if internally he was aware that Sutton Turner considered the financial situation of Mars Hill to be precarious? 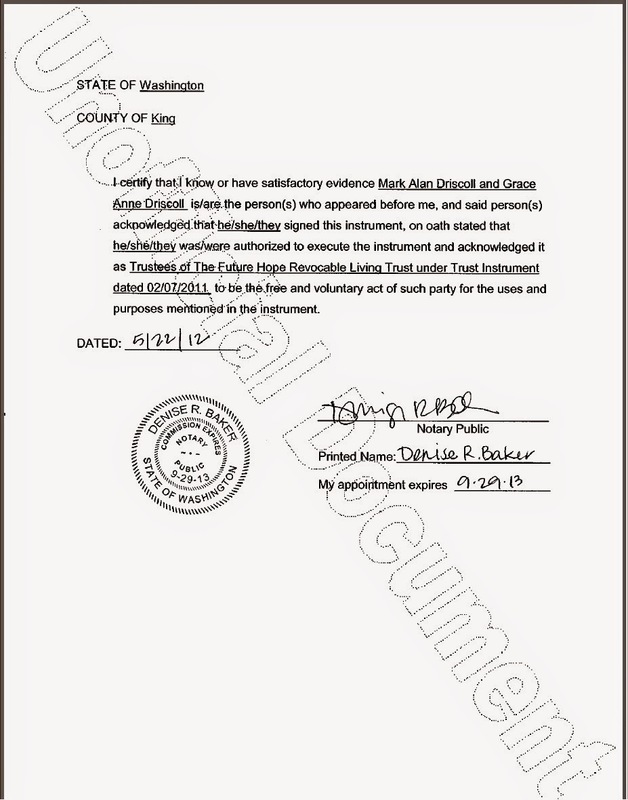 For those who don't recall what was getting tossed off but excited mention, March 2012 was around the time Driscoll mentioned "we even rented the city of Ephesus for a day". Sutton Turner did seem to say "we're in a big mess" back in March 2012. By May 2012 the campaign to get Real Marriage on the NYT bestseller list had come and gone but not without doubts expressed internally about whether or not the campaign was going to benefit Driscoll in a way that might be bad for the welfare of Mars Hill Church as a whole. So in light of all that, there's another detail about the unity of the Mars Hill executive elders. All the elders at the executive level would have had to have known about the eviction situation at Orange County, correct? If Bruskas' missive was sent on or before May 25, 2012 that was about the time the eviction notice was inescapable for Orange County. ... Before I get into the details, let me just say, we have just completed the greatest year in the history of Mars Hill Church, any single way you measure it: number of people, number of baptisms, number of Community Groups, number of people in Community Groups, number of Redemption Groups, number of people in Redemption Groups, number of weddings, number of children, number of services, number of locations. Whatever variable you would take a look at, it’s the highest it’s ever been. So by August 2012 Driscoll was saying they'd completed the greatest year they'd ever had. That didn't quite add up (literally or figuratively) in light of the systemic deficits Driscoll had been explaining were part and parcel of the Mars Hill financial model in the preceeding months. But, somehow, against all financial realities, Driscoll interpreted the fiscal year as the best year in the history of Mars Hill. What Dave Bruskas was explaining, apparently, behind the scenes in May 2012 was not a summation of how it was the best year ever for Mars Hill on the financial side. And that was just before the eviction at Orange County became an unavoidable headline. For a bit more reading from the time. What is even more striking, if we bear in mind that Sutton Turner's memo on the financial mess of Mars Hill was as of March 17, 2012, is this, that Mark Driscoll was explaining on March 2012 to Mars Hill "we are not a wealthy church". This was discussed on March 18, 2012 at Wenatchee The Hatchet. So we've got a Mars Hill in May 2012 that was about to face the Orange County eviction, had rigged a spot on the NYT best seller list for Mark and Grace Driscoll, and was internally getting word at the highest levels that the financial situation was bad. Driscoll, in the wake of all this, opted to tell Mars Hill Church "we're not a wealthy church". 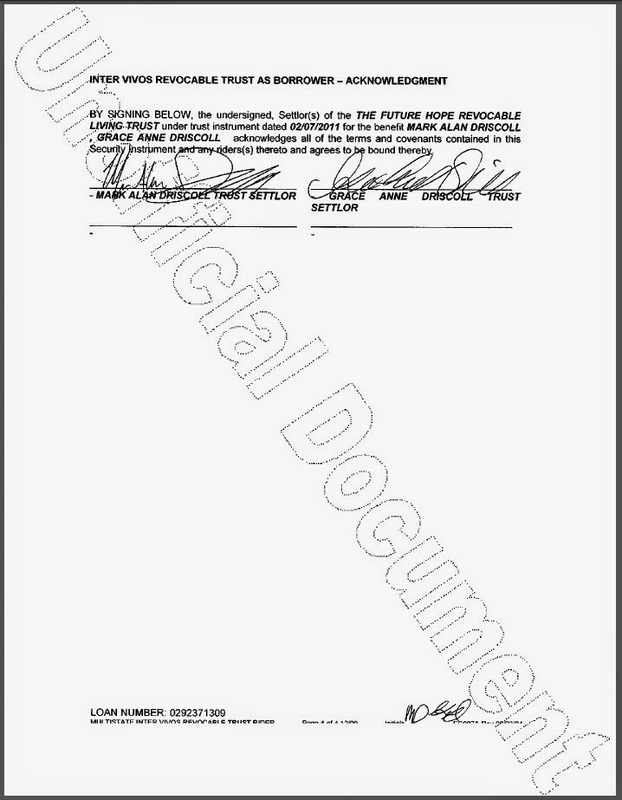 Dave Bruskas' March 25, 2012 communication can't just be seen in light of the fiscal crisis of Mars Hill as a whole but needs to be seen in light of a specific real estate purchase, one that had been finalized just days earlier. Now if you'd like to read more about the history of the acquisition of the house in light of the Real Marriage arrangements you can read the series of tagged posts on the matter over here. The permitting for renovating the house in Woodway started getting clearance some time in the summer of 2012. The Driscolls had finalized the purchase of a roughly one-million dollar home in Woodway mere days before Dave Bruskas was telling leaders within Mars Hill "we really need your help". So while at the executive level there was some awareness that Mars Hill was "in a big mess" over finances this was handled by what seems to have been a mass layoff and a temporary compensation cut for Driscoll that was leveraged as evidence for Driscoll to get paid even more and amidst all this in 2012 Mark and Grace Driscoll bought a million-dollar home in Snohomish county in a year in which Mark Driscoll was telling Mars Hill "we're not a wealthy church". While having taken a bit of a break from blogging about MH here at Wenatchee The Hatchet, others have written a few things. Becky Garrison has a piece published with American Atheist that does a review of the financial and governmental shifts that have taken place in the history of Mars Hill. Willa Paskin discusses pop culture obsessions and why it's usually not the most popular thing at a given moment. We may become obsessed more frequently than before, but our obsessions are narrower. Water-cooler subjects of decades past had far more reach than the water-cooler subjects of today. One hundred forty million people watched the miniseries Roots. Eighty-three million watched the conclusion of Dallas’s “Who Shot J.R.?” storyline. Thirty-five million people watched the first episode of Twin Peaks. Just 3.5 million people watched the finale of True Detective the night it aired. Fewer than 1 million people tuned in for the Season 1 premiere of Girls. Only 200 to 250 cronuts go on sale each day. The bar for what constitutes something “everyone” cares about is a lot lower than it once was. Having to “find” these objects is part of their appeal. 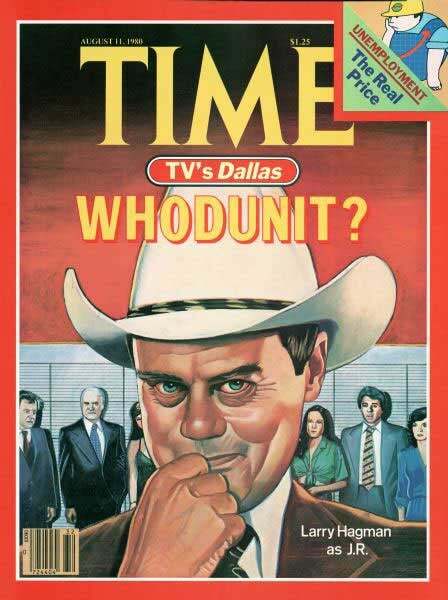 You could adore Dallas, but with 83 million people watching it, you could not imagine that adoring Dallas was somehow particular to you, somehow a marker of your unusually good taste—your grandmother and your mother and your brother and Time magazine were nuts about it, too. But the things we obsess over now are things that we at least believe we have sussed out of the vast cultural morass. And if you have done the requisite cool-hunting to find these objects, then so has everyone else who loves them. Obsessions don’t just mark us as individuals with stellar taste; they signify our belonging to a particularly sophisticated cohort. And that might single-handedly explain why over on places like Browbeat and TV Club over at Slate have round tables and blog posts about Archer rather than My Little Pony: Friendship is Magic or Avatar: The Last Airbender. Why should Slate writers discuss cartoons that get watched by waves and waves of kids if they can talk about something kids probably shouldn't watch just yet? Not that Wenatchee The Hatchet hasn't enjoyed all three shows, mind you, and things may well get written here about all three shows, but Slate ... ? As Willa Paskin was saying ... .
As Archer goes ... this article attempts to frame the show in the history of Cartoon Network in general and Adult Swim in particular. During his more than decade at Adult Swim, Reed wrote several episodes of Sealab 2021 taut enough to serve as models for aspiring screen- and comedy writers; more often, though, he was happy to bang a joke pretty damn hard with his own rake, and his oeuvre betrayed a writer too in love with confounding expectations, too eager to abandon his heroes and follow some secondary (more likely tertiary) character, one he knew viewers actively disliked — as if he were taunting the audience, as if the joke were really on you. Archer certainly employs a number of now de rigueur alt-comedy tropes: a fondness for delayed payoffs, punch lines that serve as trapdoors or springboards to other jokes, recurring in-jokes that reward dedicated viewers. But Reed has finally — or at least mostly — embraced a basic and unavoidable truth: No matter how funny you are as a writer, if you continually abandon characters and digress from a plot, you thin a story until it is vapor, leaving only the combustible cleverness and a match for your story’s self-immolation. But to some degree an idea that could be overlooked in the evolution of animation in the United States as a subversive medium that could have gotten some mention was that cartoons have generally been seen as 1) for children and 2) for instilling a set of ethics or ethos. Think of long-ago odes to Optimus Prime in Wired and "cold war moral clarity". Using animated narratives and characters to subvert or question the kinds of cartoon moralism that cartoons have been expected or required to hand down to a presumed-prepubescent audience is part of the subversive fun. A matter that could be potentially missed in the matter of subversion by one or two conservatives (and those who may not realize how much animation has changed in the US in the last thirty years) is that part of liking something "ironically" is not necessarily in the liking of a thing itself. Over the years I have told people that I have always enjoyed animation, hoped to work in it (but realized I didn't have the eyes or steady hand for it), and that by contrast ... well let's consider what the opposite of kids' shows really is, "adult" entertainment? If anything the more time goes by the less certain it seems that the things children and adults ultimately hope for in life are as fundamentally different as some adults say. Watching, enjoying and analyzing cartoons has been fun, and it is fun. One of the many things that makes it fun to write about cartoons is observing that in American culture the cartoon tends to be the medium through which grown-ups tell children stories that demonstrate or encourage those values that grown-ups most wish children to learn. We can learn the most about what values are sacrosanct in various strata of American culture by looking at what characters and narratives are presented as "safe" for children to observe. With the emergence of shows like The Simpsons, or Beavis & Butthead, or Aeon Flux, South Park, or any number of shows you could pick from Adult Swim, half of what is subversive about any of these shows is working in the medium of animation to begin with. It shouldn't be in itself but American academia and cultural punditry is never likely to catch up to this particular reality about pop culture. Why look down on cartoons as a medium if a cartoonish boiled-down narrative is what the grown-ups keep resorting to in the op-ed pages of political magazines? OVer at NPR and The Atlantic there are a couple of interesting links about the changing measurments and metrics of what music gets listened to vs what companies can measure in terms of sales. I think that last thing is called "dynamic range compression" within the music world and it's the bane of many a new song! As for songs and singing ... another bit from The Atlantic on why actresses sometimes opt to become folksingers. Reinventing yourself as a singer shifts the focus to your voice rather than your look and in an image-mindful milleu such as cinema the image can be an unforgiving medium. Maybe the reason so many people may harken to the pop and rock of old is not necessarily because it's all better so much as because rock/pop has developed its own canon and there's a sense in which if we're going to get stuck hearing the same four or five chords strummed rhythmically across the board we could try to go back to the songs that defined the clichés rather than repeat them. You can listen to "Blurred Lines" if you want ... or you can listen to Marvin Gaye. Norah Berlatsky, who's got a book on Wonder Woman that's coming out soon, writes about the futility of the school-ish advice to "find your voice" as a writer when, in the real world, nobody wants to buy YOUR voice so much as your ability to assimilate the voice of someone else. As for some pending/ongoing projects. the transcription/analysis of the 2008 spiritual warfare session is taking some down-time. One can only handle so many hours of circa 2008 Mark Driscoll talking at length about spiritual warfare. There's musical stuff incubating for probably 2015 and stuff about cartoons that may also just have to wait until 2015. But the blog's on a semi-hiatus for some of its ... "expected" topics. 6. If you choose to live in a theological echo chamber you have willfully chosen to only learn what you already know. In light of the self-congratulatory impulses left and right about Mark Driscoll and Mars Hill it seems necessary to point out that half a decade or more of the Pyromaniacs crew blathering on about Driscoll accomplished absolutely nothing in much the same way that the Salon/HuffPo crew went on for at least a decade to no effect at all. What changed the game, if we have to call it a game, was that things happened and got discussed across the boundaries of the usual echo-chambers of the theological/political "left" and "right" respectively. The anti-elder is a dictator. The anti-elder is an addict. The anti-elder is a bully. For a second or so Challies had me worried. Was he thinking (all) about me? But since blogging was not on his list, the editors of Old Life must qualify as godly elders. Typical eeeeeevanjellyfish dog-piling (does that qualify as a mixed metaphor? ), once Driscoll has been exposed and is down and out it is now permissible to jump on the anti-Driscoll bandwagon. Where was this post a year ago? Two years ago? Three? you get the drift. Challies post about Driscoll focused on “character” — and this post is written long the same lines as the earlier post from August — if you don’t have a biblical form of church government (ie Presbyterian) then you have to hope that your pastors have good character. We now know that Driscoll was playing the tyrant for years thanks to poor church government and his YRR celebrity buddies. The entire CEO-pastor phenomenon is based on a low view of sin and a high view of popular personality. If one takes stock of the reality of our sinfulness and of the tendency of power to corrupt, then one would want a system whereby the pastor is really accountable and church members have a right not only to trial, but also to appeal. If the subtext was Driscoll it's just a case of someone appropriating the term evanjellyfish turning out to be one. Doug Wilson may only have been safe from Driscoll's downward spiral by dint of not being important enough to anyone beyond Idaho to have garnered the same kind of acclaim. For many years Mars Hill Church was led by a board of Elders, most of whom were in a vocational relationship with the church and thus not able to provide optimal objectivity. To eliminate conflicts of interest and set the church’s future on the best possible model of governance, a Board of Advisors and Accountability (BOAA) was established [emphasis added] to set compensation, conduct performance reviews, approve the annual budget, and hold the newly formed Executive Elders accountable in all areas of local church leadership. This model is consistent with the best practices for governance established in the Evangelical Council for Financial Accountability standards. Mars Hill Church joined and has been a member in good standing with the ECFA since September of 2012. So the question is never going to be "if" there were conflicts of interest in the history of the governance of Mars Hill because the BoAA and Mark Driscoll himself have simply conceded conflicts of interest existed in their own words. The question is "what" those conflicts of interest actually were and whether or not the by-laws drafted and amended some time in later 2011 successfully dealt with whatever those conflicts of interest may have been. This may be all the more worth considering and investigating for those who are interested in this with the corporation formally dissolving at the end of this month. a small vacation and a preview of hoped-for coming attractions. While the spiritual warfare session Driscoll gave in 2008 is not fully transcribed or analyzed there's such a thing as taking breaks and the Thanksgiving holiday was, thankfully, such an occasion to take a break. Longtime readers of the blog will probably even remember that analyzing and discussing and preserving the history of Mars Hill and the public ministry role of Mark Driscoll wasn't even originally intended to be the main focus of this blog. It was intended to be more about animation and classical guitar music written by composers not-from-Spain. Well, I managed to pick up the scores for all of the Ferdinand Rebay solo guitar sonatas and one of the new goals is to blog about them and, where possible, direct readers to existing recorded or filmed performances of the sonatas. For those unfamiliar with previous blogging on Rebay's music, those posts aren't tagged yet but it won't take long to find search results for Ferdinand Rebay at the moment. Another little project that's incubating is getting to blogging about the grand sonatas of Matiegka. Matiegka and Rebay have been favorites of WtH lately. So while 2014 may remain the year of blogging about things more connected to Puget Sound in 2015 (or maybe, ideally, earlier) you should be seeing some blogging about Rebay and Matiegka. There's also little write-ups pending on recordings of chamber music written for the guitar featuring other instruments like double bass, trumpet, viola, mandolin ... stuff like that. Having explored the Martian landscape and history at some length and seeing as the corporation is dissolving anyway, maybe next year can get back to being about classical guitar music and cartoons. But that's likely next year. The 2008 spiritual warfare transcription project is, believe it or not, only about halfway done and it gets freakier the further along it goes. 2) doubting the executive eldership's love for the church is a demonic lie. The double claim of super-powers with a fairly literal demonization of dissent against executive leadership could be taken as the beginning of what Steve Tompkins has called the "ad hominem narrative" in Mars Hill culture. If you listen to the entirety of the 2008 warfare teaching event not just as an abstracted discussion of Mark's counseling approach, or a discussion of "demon trials", and also read it as a political statement then it's not that hard to see why so many in leadership would have come to a place of avoiding speaking up if they heard Mark go on at such length about being able to "read people's proverbial mail" and explicitly condemning questions about the executive leadership's love of the congregation as explicitly demonic and false. Anyway, Wenatchee The Hatchet hopes that all of you who celebrated Thanksgiving had a pleasant Thanksgiving.